General Election 2015 Work of Art Unveiled - Matassa Toffolo Ltd. 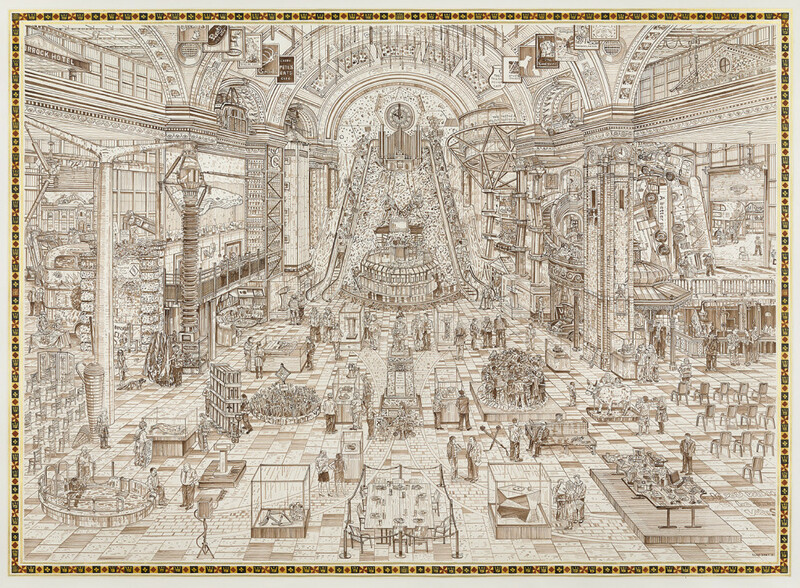 The Government Stable by Adam Dant was unveiled in the Speaker’s House in the House of Commons on 16 September 2015. Based on ‘lightning sketches’ made on the campaign trail, Dant’s interpretation of the 2015 General Election takes the form of a single, monumental, sepia ink drawing of a fictitious ‘General Election Campaign Archive’. The Speaker’s Advisory Committee on Works of Art approved the appointment of an Election Artist in October 2014, and Adam Dant was selected from a list of artists proposed by Matassa Toffolo. The drawing becomes part of the Parliamentary Art Collection and goes on display in Portcullis House on Saturday 19 September for the London House Weekend and will subsequently move to a public location. The House of Commons, in collaboration with Adam Dant and TAG Fine Arts, plan to produce limited edition prints of The Government Stable, available for sale via TAG Fine Arts later this year. This entry was posted in Event on September 18, 2015 by Matassa Toffolo Ltd..